One of my SL projects was to run a car company. I wasn't great at building cars, but I enjoyed the process and liked my designs, and enough people liked them as well to build up a small following. 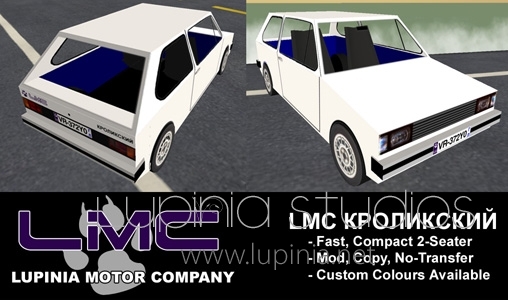 The company is called Lupinia Motor Company (LMC for short), and it still stands today, though I seldom play SL anymore. This particular model started as an exact replica of Fox's Volkswagen Rabbit restoration project, and I gave him one as a gift. I decided to sell a version of it, but due to trademark issues, I couldn't sell it with that exact name. So, I created my own brand, and Lupinia Motors was born. This is a sales poster that still hangs in my dealership, one of the first I made.